Ocean, clouds, rocks and trees; birds, boats and buildings are just a few of the many elements that have inspired generations of artists in the creation of masterful works of art on Cape Ann. 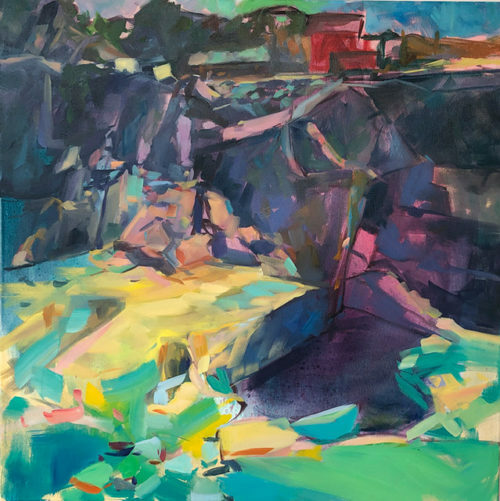 The Rocky Neck Art Colony (RNAC) is pleased to open the 2019 season with the highly anticipated annual spring members’ show. ROCKY NECK NOW, 2019: Looking All Around provides the opportunity for artist members to display work inspired by many of these same elements—and more. The exhibition runs for seven weeks beginning Thursday, February 14 and continues through Sunday, March 24, 2019 at the Cultural Center on Rocky Neck, 6 Wonson Street in East Gloucester. The exhibition features recent work by more than 30 of the Rocky Neck Art Colony’s artists. This show, open each Thursday through Sunday, noon-4:00 PM. in both galleries at the Cultural Center includes a wide range of artistic interpretations with representational, abstract and expressive styles in all media. View the art, meet the artists and enjoy light refreshments, drink and lively conversation along the way. Visitors to the galleries are encouraged to participate in the popular Viewers’ Choice Award by voting for their favorite work of art. Three artists receiving the most votes will be recognized at the closing celebration on Sunday, March 24 at 3:00 PM. These awards provide the artists and the organization with important feedback from the community.